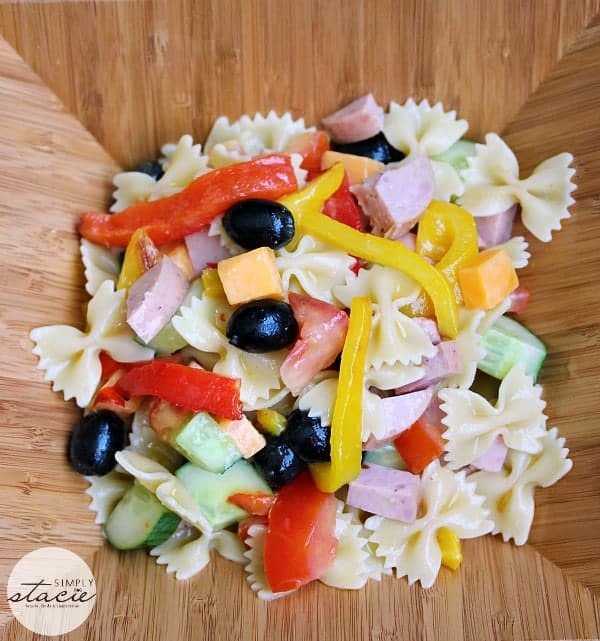 I think one of the reasons I love making pasta salad so much is that its so versatile! The pasta is like a blank canvas just waiting for you to add flavour and colour to make it a delicious dish to serve your friends and family. The only way you can really mess it up is to undercook the pasta. It tastes delicious with veggies, cheeses, meat and whatever you feel like adding in. I made this pasta salad with roasted peppers. My youngest daughter can’t get enough peppers and eats them raw like an apple. She loved them roasted in this salad too. Add some cold meat, cheese, olives, fresh veggies and a dressing made out of mustard, vinegar and olive oil and you have a crowd-pleasing meal! I like to use the bowtie pasta because of the presentation but you can use whatever small pasta noodles you have on hand. 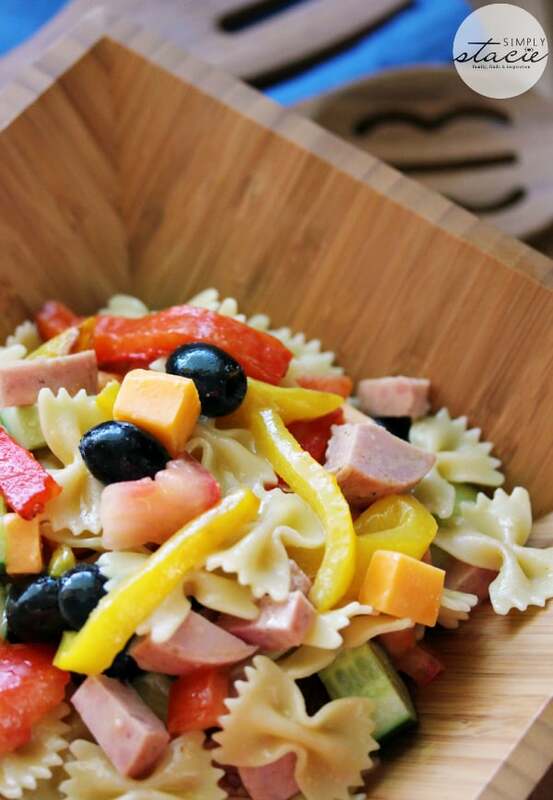 For more pasta salad, check out these recipes: Greek Pasta Salad, Chili Pasta Salad, Easy Bacon Pea Pasta Salad and 15 Pasta Salad Recipes for a Summer Picnic. I also have a Pasta Salad board on Pinterest for recipe ideas and inspiration. Colorful, fresh and filling! I love serving this salad at summer barbecues. Cut peppers in half and place on a baking sheet. Broil for 10 minutes. Remove from oven and let cool for about 10 minutes. Peel off charred skin and cut peppers into strips. Set aside. Blend together garlic, vinegar, mustard and salt. Gradually pour in oil and whisk to combine. In a large bowl, combine peppers, pasta, tomato, cucumber, olives, cheese and salami. Pour in vinaigrette mixture and toss to combine. Another great salad!!! Roasted peppers are had with almost every meal here during the summer! oh this looks absolutely delicious! i love how you added in some Kielbassa!! I like the taste of roasted peppers but also like them raw, so either way I have a delicious and healthy salad. Sounds really good, never thought about roasting the peppers to put into pasta salads. Thanks for the recipe. Yum! This is such a bright and colourful salad! Thanks for the recipe! Sounds like a delicious salad with all your food groups. I made a pasta salad earlier too, but with sun dried tomatoes and red wine vinegar. Another delicious recipe that I can’t wait to make, thanks so much for sharing!! Nice twist to pasta salad, thanks! Love pasta salad. I bet the roasted peppers would be very good! Maybe with a good goat cheese instead of cheddar…not to change your recipe as it sounds really good! My mine just starts wandering. 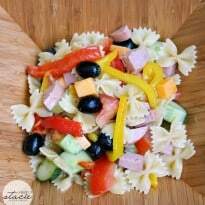 I agree, pasta salad is very versatile, you can serve it as an accompaniment or you can serve it as the main dish. Thank you for sharing this recipe. Oh this looks amazing!! I can see this going beautifully with steak yumm! This looks easy and yummy. Looks like a nutritious, tasty dish my boys will eat! Sounds great, thanks for sharing this recipe. I going to try this out. I love this recipe. I will definitely make it. Your recipes are so wonderful, I’d lve to have lunch with you. This is really pretty too. I love the colors. My son used to love celery and tomatos. Not peppers. My husband loves peppers. Thanks for sharing. This is perfect for lunch or dinner, when I don’t want to cook and heat up the house! I could cook the pasta at night when it’s cool and have it on hand for this! I’m definitely going to have to try this salad, I love, love, love peppers. This recipe looks so delish and one my whole family would love we have to try this one. I am definitely going to try this recipe. I love pasta salad during the summer! I might use some green olives instead though. 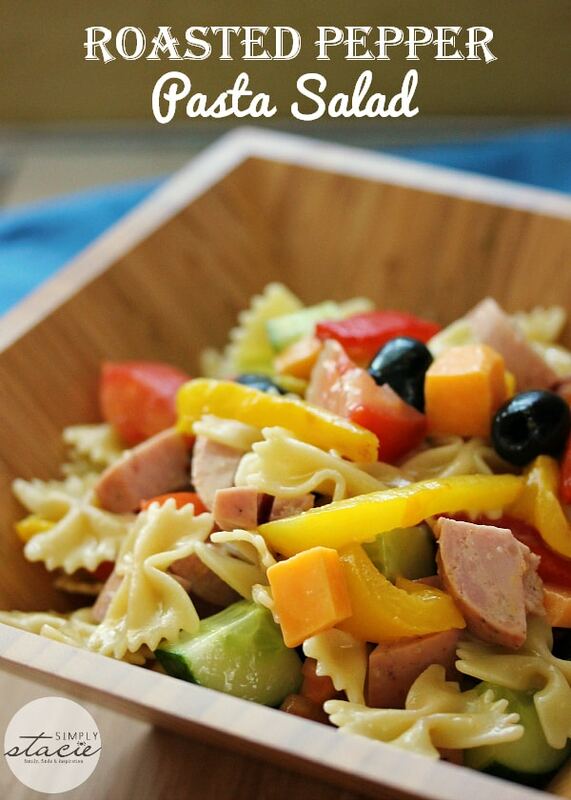 This roasted pepper pasta salad looks yummy! This beautiful salad looks so colorful and I think it would be a meal for me too! It looks very delicious and a must try for sure! This salad looks so good,i can’t wait to make it again!